Announced in 2011. Started shipping in 2012. 100 Gb/s cards accept 4 CFP2 transceivers. A chassis can support up to 32 100-G ports. The only interfaces supported are SR10 and LR4. 23. 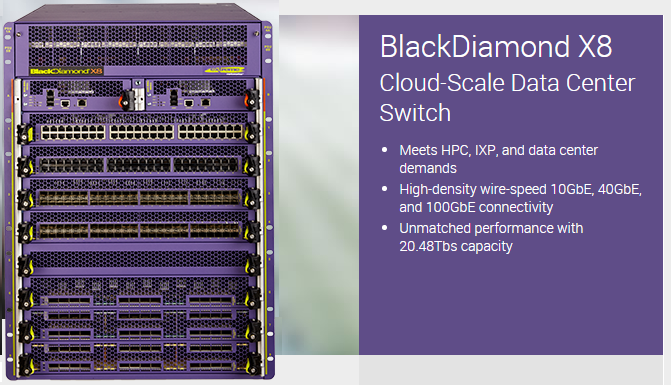 What will the switch buffer sizes on BlackDiamond X8 switches be? The I/O modules will support a 9 Mbyte (72 Mbit) packet buffer per 24 x 10 GbE ports or 6 x 40 GbE ports. This means that the 24.port 40 GbE module will have 36 Mbyte, the 12.port 40 GbE and the 48.port 10 GbE modules will have 18 MByte. Each of the switching fabric modules (FM) will support a 36 Mbyte (288 Mbit) packet buffer. This means that the FM packet buffer total will be 144 Mbytes when four FMs are installed. These are very modest buffers. That there is buffer in the fabric modules is interesting. This may be more useful for multicast replication than it is for buffering large flows. Extreme Networks Summit X670 TOR switch provides 9MB of smart packet buffer across 48, 10GbE and 4, 40GbE ports. Similarly, the Extreme Networks Black Diamond X8 utilizes shared smart buffering technology both on its I/O modules as well as on its fabric modules or example, the 24-port 40G module uses four packet processing silicon chips, each of which provides 9MB (72Mb) of smart packet buffer. A small number of buffers are reserved on a per-port/per-queue basis, which is configurable. The rest of the buffers are available as a shared pool that can be allocated dynamically across ports/ queues. The emphasized sentence above says that Extreme software exposes knobs that permit buffer thesholds to be adjusted to position the switch between dynamic pool allocation and port allocation. Knobs are good. The paper somewhat over discusses buffer bloat and should not be relied upon in this regard. Owners of Extreme switches should use this psper to get their manufacturer's slant.